T-shirts have a unique way of being a staple piece that could either be unique or hilarious and Wordans Canada recognizes your need to have an ample supply of them! We’ve teamed up with them to provide you a Vouchercodes.ca exclusive code to save 15% off your entire order. We also have a huge selection of discounts of all sizes on the Wordans Canada coupon page. Shirts are easy to make thanks to their drag and drop system. You start by choosing which shirt design and color of your choice and then pick the design and/or text and voila: you’re done! They even have a discount when ordering in bulk for multiple people such as a group of friends or a business. With St-Patrick’s Day coming up, it’s a good idea to plan out apparel to celebrate your true Irish roots. Wordans has a huge selection of St-Patrick’s day designs for you to choose from. 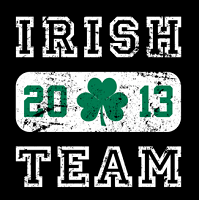 One of my favorites was this Irish Team 2013 logo and the I see Irish people design. If you have a secret geek side like I do, you’ll get a chuckle out this Keep Calm, Yoda style shirt and property of Hogwarts design. Free shipping is available on orders of $250 or more. Have you ordered from them yet?